My daughter is a big fan of the Avengers cartoon and is disappointed that Legendary doesn't have wasp... So I played around with Gimp and came up with these. If anyone has any better ideas I'd like to here them. Or Places to get better images. I just searched for images using google and bing. Edit: update rare and grammar error. As someone who contributed in a small way (no pun intended) to this design for Wasp, thank you for making these cards a reality. Good job! Rare: The artwork appears to squished? Like it's the wrong aspect ratio or something? I see you changed the Avengers ability to a Tech ability. Not a bad change since it combos with her Tech cards, but I see her more as the ultimate Avengers teammate than a Tech hero. By herself, she's not really that powerful, but, with her teammates around her, she's mighty and an integral part of the team's effectiveness. In the cartoon, she's the one Avenger who seems to want to make the team into a family. I feel her rare card should reflect her teamwork/team-building aspect thematically. 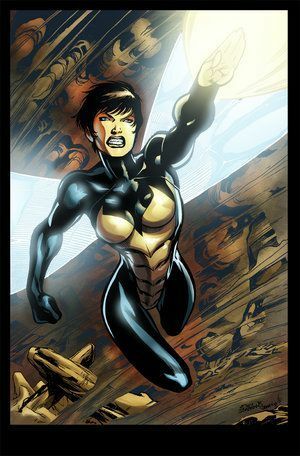 Common 2: Not really an iconic image of the Wasp? I have difficulty identifying it as her. I would suggest locating a better image if possible. As for where to find images, I usually look through the character's image galleries on comicvine.com. DeviantART.com is also a good place to find images. But I think those sites usually show up in Google's image search, so I'm not sure how helpful that is. P.S. I love the Avengers cartoon, too! P.P.S. 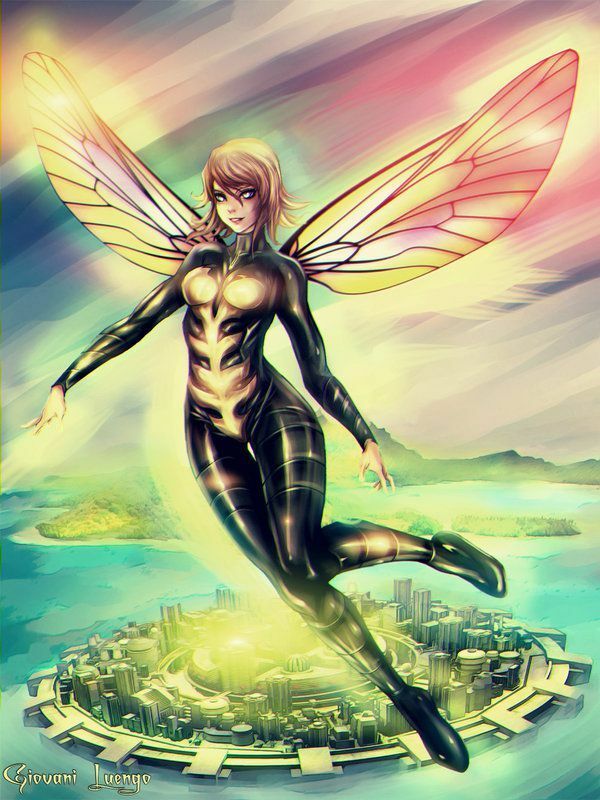 The Wasp design shares a lot thematically with the Hank Pym design challenge that okami31 and I worked on. That actually might be my favorite design for any custom Legendary card, if I do say so myself. I'd love to see someone turn those cards into a reality, too. I thought about making her rare a +1 for avengers instead... I think that more symbolizes team player. Also works with her first card .. although I may increase her cost then. As for the images... I was looking for an image of her shrinking for common2, that was the best one I found. And the rare is squished a little to make sure it fit on the card. ( And she is more slimming :-) ) I'll check the sites you mentioned to see if I find better artwork. Antman is probably going to come after Vision and Dr. Strange.... by child demand. I can see the avengers +1,but I like it the way its made here because then she will work with non-avengers as well like the Spiderman sets and Elektra. Good job on them too. You get +1 Attack for each Hero you have played that costs 2 or less. You get +1 Attack for each Avengers Hero you have with a different color. The first ability works just fine with non-Avengers heroes, and it's designed to combo with the "Pym Particles" common cards (which allow you to adjust the cost of cards) in both of the designs for the Wasp and Henry Pym we worked on. Thanks a bunch for making these! I am okay with the changes you've made here and there and I would really love your take on Ant-Man. After all, we worked on them at the same time because the Avengers would greatly benefit with their inclusion. Here's some additional art just in case you wanted more pics. I'm hoping to work on ant man this week. I don't think I was going to make any serious changes to him. 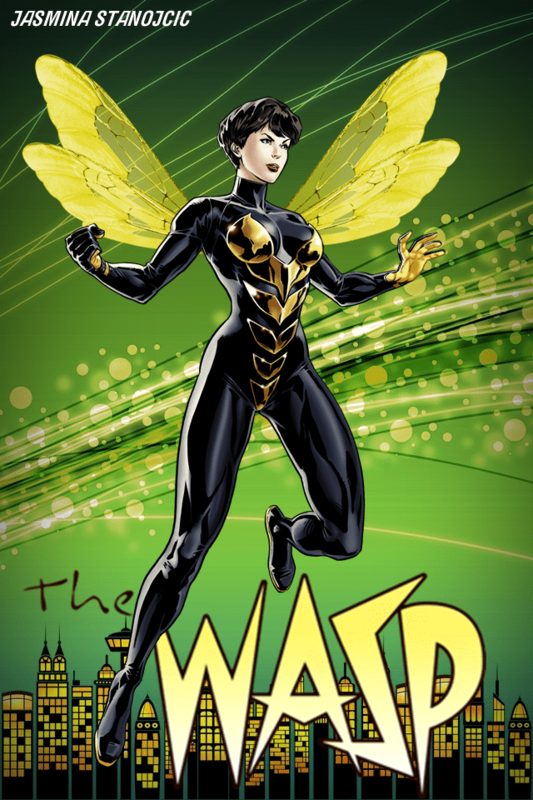 The only real wasp art I couldn't find was one of her shrinking. I may use her first image for her rare one. So I know I'm well & truly hooked now. Came on here today to D/L one custom character, ended up spending the entire day doing so! Then when I saw this character wasn't finished, I went ahead & took the plunge. I'm used to GIMP, but there were a lot of text techniques I didn't know that I had to learn (getting that outline around the fonts was a PITA! ), had find out which fonts to use, download them, etc. ANYWAY, hours later ( ) & I have the first card done. Rest should go fast now that I have & have learned what I needed to know, but it's late & I'm tired. So here it is for preview. Be kind, it's my first. Let me know if it looks ok or if there's anything that's off, & I plan on finishing the rest in the am. Good image bleeding effect and pic (I didn't even find this one). The text seems a bit off, but that's a very minor difference. Thanks! I just noticed the problem a few minutes ago while working on the 2nd card: when I tried to download the regular Swiss 721 CN BT font I got the BOLD version instead. Couldn't quite put my finger on what was wrong until I noticed the "bold" in the title this am. Got the regular one now & it looks much better. Updating above. Jan can grow as well as shrink, the name of the card IS "Pym Particles", & it does add as well as subtract, so I think it works. So, hopefully ok for a first attempt. Thanks to Paul for the design. Hope it was ok I redid the art on it. Wanted to add this one to my Avengers, so I thought I might as well share. more options the merrier. I printed my off from artscow, and am awaiting the results. Cool! Never put an Artscow or PrintStudio order together from scratch myself, just ordered others. I didn't change any of the settings from Derare's templates, so hopefully the quality is ok. I think I'd like to put together an order of all the custom content I DL'ed yesterday (of which there is a good bit! ), but for now I think I'm going to print this one & a couple others, sleeve everything up, & play. Thanks for your update of the cards. How has she played for you? Nice job on the cards and artwork. How could you didn't make all her cards cost 2 or less? I don't they all have to be, but I am curious to know why. Because you can alter the cost with "Pym Particles". She's supposed to work with Ant-Man's variant that also deals with variance of costs. Ah. I haven't seen the Ant-Man custom.